All major casinos have several security measures installed and have strict rules and regulations to ensure that no cheating occurs in the casino. The law requires that the license of the casino would be forfeited if it tries to cheat any of the players. However, ever once in a while cheating still occurs in casinos. Though many might know it, cheating is done not just by the players but also by the dealers and the other employees of the casinos. The dealers are quite well aware of the game and all the loop holes of the casinos so they are quite well equipped with all the knowledge that they need if they want to cheat. However, it is very uncommon to come across instances of dealers cheating in Las Vegas or in Atlantic City since the security is even tighter at these two locations. However, smaller casinos and cruise ships are the places where the dealers cheat the most at blackjack. 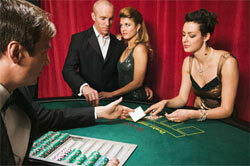 Blackjack is a game which is more prone to cheating in comparison to the other games. In blackjack, the players are pitted up against the dealer and not against other players. This often leads to cheating on the part of the players as well as the dealer. The dealers being quite knowledgeable about the game have several cheating techniques up their sleeves. Remember, that presence of dealer license do not mean the play is holding without cheating. The cheating technique known as second deal is often used in blackjack as well as in poker. In this technique the dealer deals the card second from the top rather than dealing the top card to the player. When done correctly, it can be very difficult to detect even if you are staring at the deck all the time. The dealer would generally peek at top card discreetly and then reserve it for use later while dealing the second from top card. The high low cheating technique is not very widely used by dealers today. This technique can only work in an environment where there are a lot of people and too many distractions. The method is done with help of a false shuffle where the dealer will make it appear as if he/she is properly shuffling the deck when in fact the cards are not being shuffled at all. There are several different shuffling techniques which are used at dealer cheating during the game. Dealers use plenty of different methods for cheating at blackjack. The players should be aware of these cheating methods so that the next time they are at a blackjack table at a casino they can keep their eyes on the movements of the dealer. In casinos, the players as well as the staff members have to be fully aware of what goes around all the time and knowing all the cheating methods only helps. However, since today things have changed quite drastically for casinos it is very uncommon to come across dealers who successfully manage to cheat the players or the casinos for a long time.